Carnival Cruise Line announced today [Feb 8] that the Carnival Horizon cruise ship — which is currently under construction — will offer four-day Bermuda cruises from New York in 2018 as part of the ship’s inaugural season, with five Bermuda cruises to be offered, departing May 24, June 21, July 19, Aug. 16 and Sept. 13. “The four-day long weekend’ cruises will depart Thursdays and feature a full-day visit to Bermuda where guests can relax on the island’s legendary pink beaches, enjoy snorkeling, kayaking and other water sports, and visit historical landmarks such as Royal Naval Dockyard and Gibb’s Hill Lighthouse, ” the company said. “Bermuda is a beautiful and sought-after destination and what better way to visit this breathtaking island paradise than on the spectacular Carnival Horizon,” said Christine Duffy, president of Carnival Cruise Line. “These visits to Bermuda are part of Carnival Horizon’s terrific inaugural schedule that also features top destinations throughout Europe and the Caribbean, providing our guests with opportunities to create wonderful and fun memories together,” she added. Carnival Horizon is set to debut in April 2018, with a 13-day Mediterranean voyage from Barcelona – the first of four round-trip departures from this Spanish port, and will then reposition to the U.S. with a 14-day trans-Atlantic crossing from Barcelona to New York in May 2018. 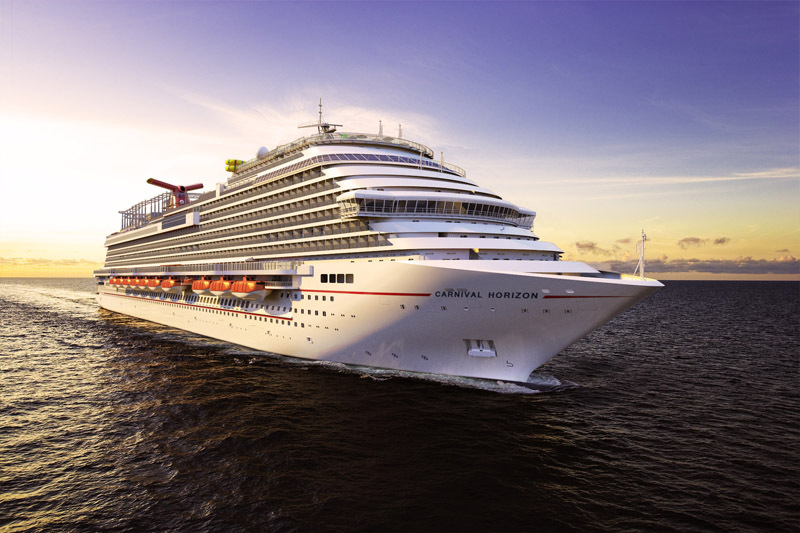 “Currently under construction at the Fincantieri shipyard in Marghera, Italy, Carnival Horizon will offer many of the hugely popular indoor and outdoor dining, bar, entertainment and activity options that debuted on Carnival Vista, currently the line’s newest ship,” the company added. “Among those is a groundbreaking bike-ride-in-the-sky attraction called SkyRide, an IMAX Theatre and a massive WaterWorks aqua park featuring a water tube slide called Kaleid-o-slide. Oh the PLP will not like this at all. I distinctly remember one of their then Shadow Ministers of Tourism during the UBP days declaring “We don’t need no paperbag cruise lines like Carnival”. The topic in the HOA that day was the renewal of cruise ship contracts. This was when we were still picking who we wanted to visit. The shipping lines were coming to us, not us going begging to the cruise lines. We’re still in the UBP days. Hmm…Seems like I am not the only one who recalls that idiotic comment. More cruise tourism for all our ports, more sports tourism, more adventure tourism… thank you BTA and Mr. Hanbury for sticking it out through all the s#!$ that was flung, for continuing to believe in Bermuda when those opposed didn’t. Mr. Dallas, you have big shoes to fill, and if your as competent as your resume says you are, then you will do Bermuda proud. I’m still waiting for a public apology from the shadow tourism Minister and his predecessors, and from all the other detractors out there, that is owed to Mr. Hanbury. Don’t expect to get it, it takes actual humanity to be able to admit the length of ones errors, and the PLP haven’t even done that for the disaster Bermudians have felt from their maladministration. @ Build a Better Bermuda, B Hanabury got all that he deserves; and some. Very nice amenities and should be good spenders . NIce ship, now the cruise lines are picking up on “long weekend” cruises to Bermuda. One day on the Island won’t see them as big spenders.